I last reported on this in June last year. Various delays have meant that publication has had to be put off but we are delighted to say we now have the first batch of bound copies and can take orders. If you have already reserved a copy we will be sending it out shortly. With our major move to a new house it was clear I wasn't going to be able to machine this myself, so I decided to ask my typesetter Stan Lane to print it for me on his Heidelberg cylinder press. Stan completed the typesetting towards the end of last year, doing a terrific job on a detailed text, not least working in my copious footnotes. I spent a most enjoyable few days with him in December, helping to get the printing underway. While Stan saw to the machining, I made up the formes ready for press, cleaned and took down formes as they were printed, and fetched reams of paper as necessary. Stan's attention to detail in the press-work matched the care he gives to his typesetting, and as the pages came off the press they did look good. We got through about a quarter of the formes but then I had to leave Stan to finish the work. I would have dearly loved to have completed the work with him. Everything finally went off to Ludlow Bookbinders: 12,000 printed sheets; the dust jackets, spine labels, and folded and gathered sections for the extra volume in the de luxe copies which I had managed to print before our move; marbled sheets for the de luxe; and a great stack of printed photographs for the tip-ins. This is the first of three volumes. (I had anticipated a fourth, on the Bible Press, but have decided it is more suitable as a long journal paper and hope to have it published in that format in the future.) It sets the scene by describing the first key resource of the Press, namely the sequence of premises that it occupied over the period: its first home was the Sheldonian Theatre and by the end of the period it was settled in the Clarendon Building further along Broad Street. But between those two magnificent buildings, in space and time, the Press had a third home in wooden premises that were initially built especially for it but that were subsequently pulled down to make way for the Clarendon Building. How did all these come about? Where did the presses go? Where was composition done? What was the flow of work around the building? The second topic covered is the roles that made up the management of the Press: the Architypographus, the Warehouse-keeper, and the Printer. Whilst John Fell and his partners worked hard to get the Press off on a sound managerial footing in the early 1670s, over the decades mismanagement became the order of the day until William Blackstone took it by the scruff of the neck and restored order in the late 1750s. Finally the book delves in detail into the history of the second key resource of the Press: the paper that it used, covering where it came from, how it was obtained, how much was paid for it, and how it was used and stored. At the outset good paper had to be imported from the Continent and supplies were disrupted by war. Later, monopolies and taxation aggravated matters. But as matters settled and English papermakers such as Whatman established themselves the situation was regularised. To illustrate the narrative, ten contemporary documents from the University Press archives and the Bodleian Library are newly reproduced as tipped-in photographs. Copies of the de luxe edition come with an extra forty-page volume, Correspondence on Paper, that presents a collection of more than forty hitherto unpublished letters from London paper dealers to Thomas Yate from the 1670s. These documents, now in the Bodleian Library, are revealing for what they tell us of the difficulties that the early University Press had in obtaining supplies of paper from the Continent at a time of war. The letters have been carefully transcribed and edited with explanatory notes. 1699-1780: Where did the paper come from? The book makes 168 pages and the page size is 276 mm by 216 mm, the same size as all our previous titles on Oxford University Press. The text has been set in 12pt Monotype Van Dijck and 260 copies have been printed on 148gsm Mohawk Superfine paper. The end-papers are also Mohawk Superfine. 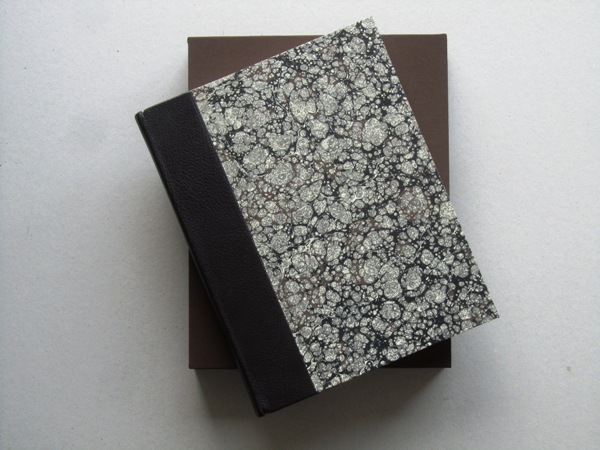 BINDING A: Fifty de luxe copies are quarter-bound in dark brown leather with a paper specially marbled by Jemma Lewis on the boards. The additional volume is printed on an antique Rives BFK mould-made paper and case-bound in full brown cloth. The two volumes are presented in a cloth-covered slip-case also in brown cloth. £320 (€460, US$500)). 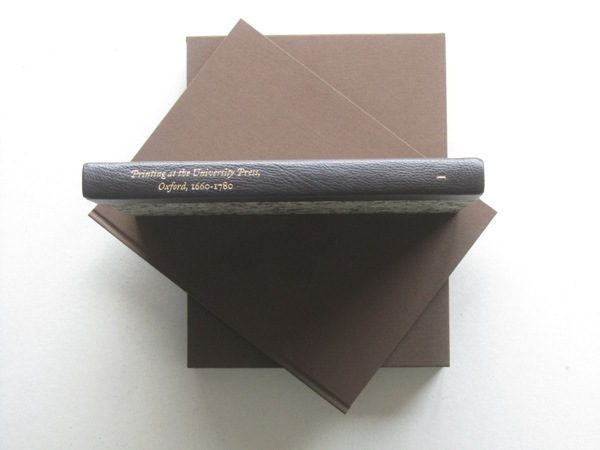 BINDING B: The standard copies are case-bound in brown cloth, with a printed dust-jacket of gold Hahnemühle Bugra Bütten. £125 (€190, US$200). Ten copies are reserved in sheets for binders. £60 (€95, US$110). A paper prospectus can be sent on request - it adds no further detail but is indicative of the type and paper used. You can order by email or by writing to The Old School Press, Cliff Edge, Beer Hill, Seaton EX12 2QD, UK. Trade discount is a quarter. Shipping is charged extra at cost. The second volume - now in typesetting - is devoted entirely to the Press's third major resource: its type. Initially the Press was reliant on outside founders, then had its own foundry and the means to cut new faces, but by the 1730s had ceased making its own type and was buying from the then established English typefounders. The volume will contain sixteen photographs of contemporary documents and five photographs of ancient punches and matrices. The de luxe edition will additionally contain a collection of sample pages of books from each decade of the period concerned. The volume will contain eleven photographs of contemporary documents. The de luxe edition will contain an additional volume entitled Learning about printing, which, building on manuscript documents of the time, will relate the story of how John Fell and his partner Thomas Yate developed their understanding of the economics of printing large editions for sale to the London Stationers. All three volumes will be in the same format and binding. 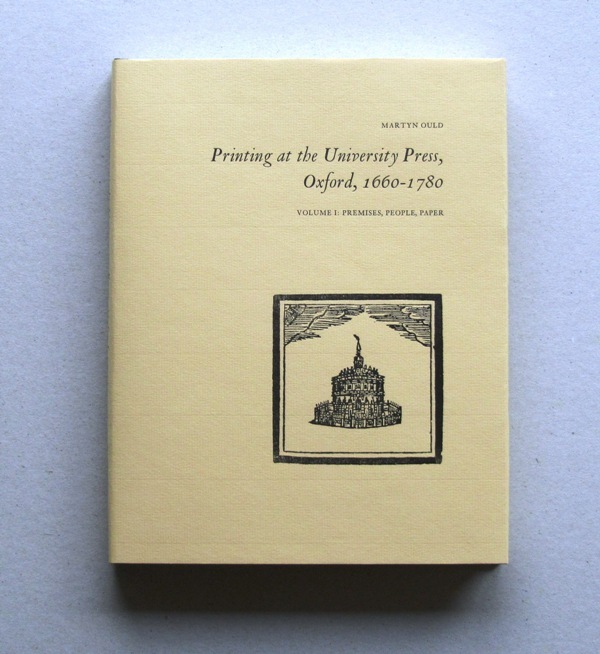 Three of our earlier publications on the printing history of Oxford University Press - The Fell Revival, Harry Carter, Typographer, and Stanley Morison & 'John Fell' - are out of print in their bound form. However, we still have some sets of sheets of each that were reserved for binders. If there were sufficient demand, we would have some of these bound to the original specification (with the original dust-jackets). So if you would like one of these titles in that form please let us know. As they would be out-of-series copies, we would offer them at a 20% discount to the original price, i.e. £60, £64, and £64 respectively, plus shipping at cost. A bargain. But please note that I will need enough takers to keep the cost of binding to a level that works. You can find details of all three titles by going to our website and clicking on the 'in print' button on the left. We unexpectedly have available a copy of the de luxe edition of this book which is otherwise sold out. Please let us know as soon as possible if you would like to buy it. First come first served. Copies of the standard edition are still available. Full details with photographs at our website.